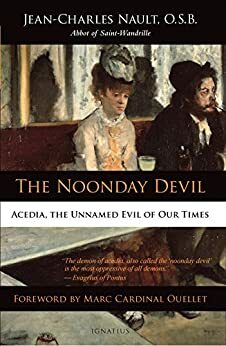 The Noonday Devil is a shorter version of a longer study of acedia done by the author, a French abbot. While it seems geared mainly for monks and students of theology, I found it quite helpful and recommend it, even to people who are not tied to monasteries or Catholicism. The book is a rich source for understanding the causes of the struggles many have with weariness, depression, feelings of being overworked, the perpetual need for change, and the desire to constantly fill one’s life with distractions to avoid the sensation of meaninglessness. While the language used in various parts of the book can be somewhat scholarly, the information is presented simply enough for almost anyone to grasp. There are many wonderful quotes and anecdotes throughout the book. I’ll admit feeling a little daunted reading about a subject that took an entire book to truly define. Acedia is a complex subject with a wide range of symptoms. In a way, it is both an affliction AND a sin. As the book notes in depth, the word “acedia” itself fell out of use throughout history and was replaced in lists of vices with words like “sloth” or “sadness” that capture only an aspect of the bigger affliction of acedia. Acedia is essentially spiritual laziness, as well as an indifference toward (and possibly a disgust with) the things of God. It leads to a loss of enthusiasm in one’s Christian witness and ultimately causes a lack of caring about the possibility of one’s salvation. This (and much more) is all stated more profoundly in the book, but I say it here to indicate the importance of understanding the subject of acedia. Just knowing what’s afflicting you is often a huge step toward overcoming it, and this book is a very helpful way of getting to know this particular enemy. I would recommend reading through the entire book, for while there is a specific section on remedies for acedia, it’s not the only point in the book where helpful advice is given for combating it. I would have liked for these sections to be longer, but the book is more about acedia as a general subject matter than merely being a book about overcoming it. Fair warning: the book is only 200 pages, and over 50 of those pages are spent on Saint Thomas Aquinas’ thoughts on acedia. This in itself is a good thing, but I feel it could have been much shorter. There are two main points this chapter was presenting, but while those points were being made, the author provided the reader with a summary of the thought of Saint Thomas, a lot of which is not nearly as accessible to the average reader as the rest of the book. The chapter is certainly worth the effort, but after reading this book a second time, I realized that most of this chapter could be skipped without losing any of the vital message of the book, as its main points are summarized well at the end of the chapter. Chapter 4, “Acedia in Different States of Life,” is especially compelling, as it lays out the various ways acedia can affect monks, priests, married and single people. No matter your state in life, you can benefit from reading each part of this chapter since you will easily see parallels between, say, what a monk might endure as a result of acedia, and what you personally are going through. 172 people found this helpful. I am overwhelmed to finally know the name of the evil which has plagued me my entire life. This book has been truly life changing. At first, I thought its reference to monastic acedia would not be applicable to me, but it is. It all is. I bought this book because I thought I was just "lazy"...little did I know I had a much bigger problem that I never fully acknowledged, but have had from childhood: a lack of real faith, of real hope...not recognizing God's desire to be present in my life at all moments. To love at all moments. To be at peace in all moments. My whole life, I had a childlike grief when I did not have my way. If only I had this, or that...I would be happy. But the truth is, I have everything, and I have it all the time. There is no need to leave my cell. The best single source on the spiritual topic of acedia. Acedia is a Greek word that names a state of languor or torpor, of unconcern or dissatisfaction with one's condition or action in the world. In a strong case it can keep one from being able to perform one's duties. The term acedia was used first used in Christianity by monks and other ascetics who lived solitary lives, and were tempted to become listless and inert, or begin longing to be elsewhere or to do something other than what they were doing. Evagrius numbers acedia as of the eight bad thoughts, and St. Thomas Aquinas (following Gregory the Great) numbers it as one of the seven capital vices (so-called because they are the source of many kinds of sin). Though related to depression, acedia is not considered entirely the same in the monastic and Christian tradition. It is usually seen as naming a fault, which is subject to one's will, rather than simply a psychological state. Acedia is to spiritual health something like what depression is to mental health. "The Noonday Devil: The Unnamed Evil of Our Times" thoroughly illuminating and practical. If you care only intellectually about the state of your soul and the goal of Heaven, but just can't seem to get motivated. Or if you know you should care, but still don't, you may be suffering from what Dom Jean-Charles Nault diagnoses as the most terrible malady - and the one that most afflicts souls today - acedia. It is more than sloth. It is the "whatever" indifference to the things of God, that is, indifference to wonder, glory, joy, and the promises of our loving God. This book is like a spiritual kick in the pants. 5.0 out of 5 starsMy worst enemy now has a name. I have to say upfront that this book is 203 pages long, and I am on page 97. I am reading it slowly, and taking notes. However, the wisdom found in this book helped me to make my best confession ever (except for the general confession in 1998, and a deeper one in 2004, after that I was told that 2004 was the "cut-off" for general confessions so I wouldn't become scrupulous). In learning what acedia is and how it affects the memory, intellect, and will, I was able to address exactly how this disposition has affected my life both interiorly and in the way I have lived, and how firmly determined I am in kicking acedia to the curb. My confessor totally "got it"; he understood the gravity of acedia and its effects; he gave me a worthy penance and that beautiful absolution. I will continue to go to confession as frequently as possible for the rest of my life, as I have been doing since 1997, but now, with more hope and a firmer purpose and a stronger determination in fighting against sin. I will add to this comment when I finish the book, but it really does make a difference to know one's enemy, and that enemy has a name: acedia.